Lehi (Hebrew pronunciation: [ˈleχi]; Hebrew: לח"י – לוחמי חרות ישראל‎ Lohamei Herut Israel – Lehi, "Fighters for the Freedom of Israel – Lehi"), often known pejoratively as the Stern Gang, was a Zionist paramilitary organization founded by Avraham ("Yair") Stern in Mandatory Palestine. Its avowed aim was to evict the British authorities from Palestine by resort to force, allowing unrestricted immigration of Jews and the formation of a Jewish state, a "new totalitarian Hebrew republic". It was initially called the National Military Organization in Israel, upon being founded in August 1940, but was renamed Lehi one month later. According to Jean E. Rosenfeld, the group admitted to having used terrorist attacks. Lehi split from the Irgun militant group in 1940 in order to continue fighting the British during World War II. Lehi initially sought an alliance with Fascist Italy and Nazi Germany, offering to fight alongside them against the British in return for the transfer of all Jews from Nazi-occupied Europe to Palestine. Believing that Nazi Germany was a lesser enemy of the Jews than Britain, Lehi twice attempted to form an alliance with the Nazis. During World War II, it declared that it would establish a Jewish state based upon "nationalist and totalitarian principles". After Stern's death in 1942, the new leadership of Lehi began to move it towards support for Joseph Stalin's Soviet Union. In 1944, Lehi officially declared its support for National Bolshevism. It said that its National Bolshevism involved an amalgamation of left-wing and right-wing political elements – Stern said Lehi incorporated elements of both the left and the right – however this change was unpopular and Lehi began to lose support as a result. Lehi and the Irgun were jointly responsible for the massacre in Deir Yassin. Lehi assassinated Lord Moyne, British Minister Resident in the Middle East, and made many other attacks on the British in Palestine. 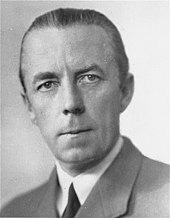 On 29 May 1948, the government of Israel, having inducted its activist members into the Israel Defense Forces, formally disbanded Lehi, though some of its members carried out one more terrorist act, the assassination of Folke Bernadotte some months later, an act condemned by Bernadotte's replacement as mediator, Ralph Bunche. After the assassination, the new Israeli government declared Lehi a terrorist organization, arresting some 200 members and convicting some of the leaders. Just before the first Israeli elections in January 1949, a general amnesty to Lehi members was granted by the government. In 1980, Israel instituted a military decoration, an "award for activity in the struggle for the establishment of Israel", the Lehi ribbon. Former Lehi leader Yitzhak Shamir became Prime Minister of Israel in 1983. Lehi was created in August 1940 by Avraham Stern. Stern had been a member of the Irgun (Irgun Tsvai Leumi – "National Military Organization") high command. Zeev Jabotinsky, then the Irgun's supreme commander, had decided that diplomacy and working with Britain would best serve the Zionist cause. World War II was in progress, and Britain was fighting Nazi Germany. The Irgun suspended its underground military activities against the British for the duration of the war. Stern argued that the time for Zionist diplomacy was over and that it was time for armed struggle against the British. Like other Zionists, he objected to the White Paper of 1939, which restricted both Jewish immigration and Jewish land purchases in Palestine. For Stern, "no difference existed between Hitler and Chamberlain, between Dachau or Buchenwald and sealing the gates of Eretz Israel." Stern wanted to open Palestine to all Jewish refugees from Europe, and considered this as by far the most important issue of the day. Britain would not allow this. Therefore, he concluded, the Yishuv (Jews of Palestine) should fight the British rather than support them in the war. When the Irgun made a truce with the British, Stern left the Irgun to form his own group, which he called Irgun Tsvai Leumi B'Yisrael ("National Military Organization in Israel"), later Lohamei Herut Israel ("Fighters for the Freedom of Israel"). In September 1940, the organization was officially named "Lehi", the Hebrew acronym of the latter name. Stern and his followers believed that dying for the "foreign occupier" who was obstructing the creation of the Jewish State was useless. They differentiated between "enemies of the Jewish people" (the British) and "Jew haters" (the Nazis), believing that the former needed to be defeated and the latter manipulated. Lehi Commemoration in Petah Tikva. Half-clenched fist, in reference to Psalms 137:5. Neither Jewish ethics nor Jewish tradition can disqualify terrorism as a means of combat. We are very far from having any moral qualms as far as our national war goes. We have before us the command of the Torah, whose morality surpasses that of any other body of laws in the world: "Ye shall blot them out to the last man." But first and foremost, terrorism is for us a part of the political battle being conducted under the present circumstances, and it has a great part to play: speaking in a clear voice to the whole world, as well as to our wretched brethren outside this land, it proclaims our war against the occupier. We are particularly far from this sort of hesitation in regard to an enemy whose moral perversion is admitted by all. There are those who say that to kill [T.G.] Martin [a CID sergeant who had recognised Shamir in a lineup] is terrorism, but to attack an army camp is guerrilla warfare and to bomb civilians is professional warfare. But I think it is the same from the moral point of view. Is it better to drop an atomic bomb on a city than to kill a handful of persons? I don’t think so. But nobody says that President Truman was a terrorist. All the men we went for individually – Wilkin, Martin, MacMichael and others – were personally interested in succeeding in the fight against us. So it was more efficient and more moral to go for selected targets. In any case, it was the only way we could operate, because we were so small. For us it was not a question of the professional honor of a soldier, it was the question of an idea, an aim that had to be achieved. We were aiming at a political goal. There are many examples of what we did to be found in the Bible – Gideon and Samson, for instance. This had an influence on our thinking. And we also learned from the history of other peoples who fought for their freedom – the Russian and Irish revolutionaries, Giuseppe Garibaldi and Josip Broz Tito. Some writers have stated that Lehi's true goals were the creation of a totalitarian state. Perlinger and Weinberg write that the organisation's ideology placed "its world view in the quasi-fascist radical Right, which is characterised by xenophobia, a national egotism that completely subordinates the individual to the needs of the nation, anti-liberalism, total denial of democracy and a highly centralised government." Perliger and Weinberg state that most Lehi members were admirers of the Italian Fascist movement. According to Kaplan and Penslar, Lehi's ideology was a mix of fascist and communist thought combined with racism and universalism. 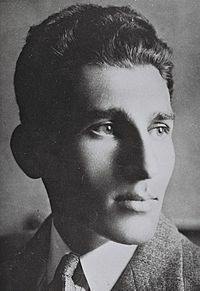 According to Yaacov Shavit professor at the Department of Jewish History, Tel Aviv University articles in publications by Lehi wrote about Jewish "master race", contrasting them with Arabs who were seen as "nation of slaves" Sasha Polakow-Suransky writes about Lehi Lehi was also unabashedly racist towards Arabs. Their publications described Jews as a master race and Arabs as a slave race. Lehi advocated mass expulsion of all Arabs from Palestine and Transjordan or even their physical annihilation. Many Lehi combatants received professional training. Some attended the state military academy in Civitavecchia, in Fascist Italy. Others received military training from instructors of the Polish Armed Forces in 1938–1939. This training was conducted in Trochenbrod (Zofiówka) in Wołyń Voivodeship, Podębin near Łódź, and the forests around Andrychów. They were taught how to use explosives. One of them reported later: "Poles treated terrorism as a science. We have mastered mathematical principles of demolishing constructions made of concrete, iron, wood, bricks and dirt." Lehi prisoners captured by the British generally refused to employ lawyers in their defense. The defendants would conduct their own defense, and would deny the right of the military court to try them, saying that in accordance with the Hague Convention they should be accorded the status of prisoners of war. For the same reason, Lehi prisoners refused to plead for amnesty, even when it was clear that this would have spared them the death penalty. 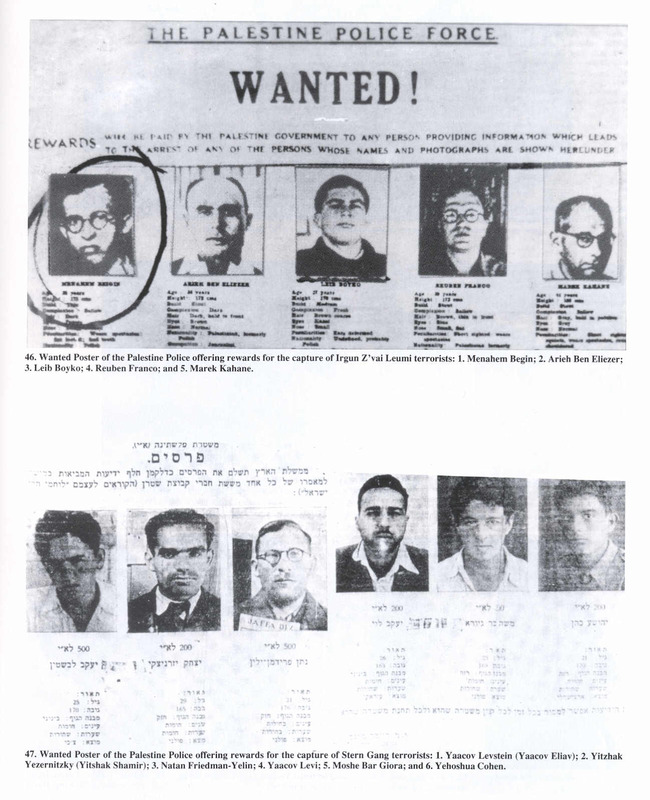 In one case Moshe Barazani, a Lehi member, and Meir Feinstein, an Irgun member, committed suicide in prison with a grenade smuggled inside an orange so the British could not hang them. Late in 1940, Lehi, having identified a common interest between the intentions of the new German order and Jewish national aspirations, proposed forming an alliance in World War II with Nazi Germany. 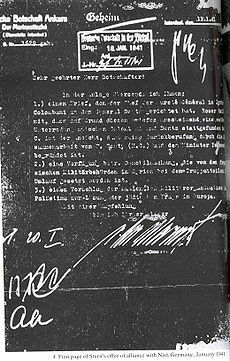 The organization offered cooperation in the following terms: Lehi would rebel against the British, while Germany would recognize an independent Jewish state in Palestine/Eretz Israel, and all Jews leaving their homes in Europe, by their own will or because of government injunctions, could enter Palestine with no restriction of numbers. Late in 1940, Lehi representative Naftali Lubenchik went to Beirut to meet German official Werner Otto von Hentig. The Lehi documents outlined that its rule would be authoritarian and indicated similiarites between the organization and Nazis. Israel Eldad, one of the leading members of Lehi, wrote about Hitler "it is not Hitler who is the hater of the kingdom of Israel and the return to Zion, it is not Hitler who subjects us to the cruel fate of falling a second and a third time into Hitler's hands, but the British." Lubenchik did not take along any written memorandum for the German representatives. Had there been a need for one, he would have formulated it on the spot, since he was familiar with the episode of the Italian "intermediary" and with the numerous drafts connected with it. Apparently one of von Hentig's secretaries noted down the essence of the proposal in his own words. According to Joseph Heller, "The memorandum arising from their conversation is an entirely authentic document, on which the stamp of the 'IZL in Israel' is clearly embossed." Even as the full scale of Nazi atrocities became more evident in 1943, Lehi refused to accept Hitler as main foe (as opposed to Great Britain). As a group that never had over a few hundred members, Lehi relied on audacious but small-scale operations to bring their message home. They adopted the tactics of groups such as the Socialist Revolutionaries and the Combat Organization of the Polish Socialist Party in Czarist Russia, and the Irish Republican Army. To this end, Lehi conducted small-scale operations such as individual assassinations of British officials (notable targets included Lord Moyne, CID detectives, and Jewish "collaborators"), and random shootings against soldiers and police officers. Another strategy, adopted in 1946, was to send bombs in the mail to British politicians. Other actions included sabotaging infrastructure targets: bridges, railroads, telephone and telegraph lines, and oil refineries, as well as the use of vehicle bombs against British military, police, and administrative targets. Lehi financed its operations from private donations, extortion, and bank robbery. Its campaign of violence lasted from 1944 to 1948. Initially conducted together with the Irgun, it included a six-month suspension to avoid being targeted by the Haganah during the Hunting Season, and later operated jointly with the Haganah and Irgun under the Jewish Resistance Movement. After the Jewish Resistance Movement was dissolved, it operated independently as part of the general Jewish insurgency in Palestine. On 25 April 1946, a Lehi unit attacked a car park in Tel Aviv occupied by the British 6th Airborne Division. Under a barrage of heavy covering fire, Lehi fighters broke into the car park, shot soldiers they encountered at close range, stole rifles from arms racks, laid mines to cover the retreat, and withdrew. Seven soldiers were killed in the attack, which caused widespread outrage among the British security forces in Palestine. It resulted in retaliatory anti-Jewish violence by British troops and a punitive curfew imposed on Tel Aviv's roads and a closure of places of entertainment in the city by the British Army. Following the bombing of the British embassy in Rome, October 1946, a series of operations against targets in the United Kingdom were launched. On 7 March 1947, Lehi's only successful operation in Britain was carried out when a Lehi bomb severely damaged the British Colonial Club, a London recreational facility for soldiers and students from Britain's colonies in Africa and the West Indies. On 15 April 1947 a bomb consisting of twenty-four sticks of explosives was planted in the Colonial Office, Whitehall. It failed to explode due to a fault in the timer. Five weeks later, on 22 May, five alleged Lehi members were arrested in Paris with bomb making material including explosives of the same type as found in London. On 2 June, two Lehi members, Betty Knouth and Yaakov Levstein, were arrested crossing from Belgium to France. Envelopes addressed to British officials, with detonators, batteries and a time fuse were found in one of Knouth's suitcases. Knouth was sentenced to a year in prison, Levstein to eight months. The British Security Services identified Knouth as the person who planted the bomb in the Colonial Office. Shortly after their arrest, 21 letter bombs were intercepted addressed to senior British figures. The letters had been posted in Italy. The intended recipients included Bevin, Attlee, Churchill and Eden. Knouth aka Gilberte/Elizabeth Lazarus. Levstein was travelling as Jacob Elias; his fingerprints connected him to the deaths of several Palestine Policemen as well as an attempt on the life of the British High Commissioner. In 1973, Margaret Truman wrote that letter bombs were also posted to her father, U.S. President Harry S. Truman, in 1947. Former Lehi leader Yellin-Mor admitted that letter bombs had been sent to British targets but denied that any had been sent to Truman. During the lead-up to the 1948 Arab–Israeli War, Lehi mined the Cairo–Haifa train several times. On 29 February 1948, Lehi mined the train north of Rehovot, killing 28 British soldiers and wounding 35. On 31 March, Lehi mined the train near Binyamina, killing 40 civilians and wounding 60. Lehi similarly interpreted events at Deir Yassin as turning the tide of war in favor of the Jews. Lehi leader Israel Eldad later wrote in his memoirs from the underground period that "without Deir Yassin the State of Israel could never have been established". Three days after the assassination, the Israeli government passed the Ordinance to Prevent Terrorism and declared Lehi to be a terrorist organization. Many Lehi members were arrested, including leaders Nathan Yellin-Mor and Matitiahu Schmulevitz who were arrested on 29 September. Eldad and Shamir managed to escape arrest. 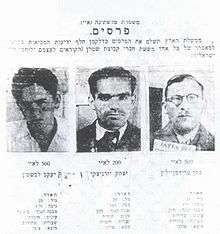 Yellin-Mor and Schmulevitz were charged with leadership of a terrorist organization and on 10 February 1949 were sentenced to 8 years and 5 years imprisonment, respectively. However the State (Temporary) Council soon announced a general amnesty for Lehi members and they were released. Between 5 December 1948 and 25 January 1949, Yellin-Mor and Schmuelevitch were tried in a military court on terrorism charges. The prosecution accused them of the murder of Bernadotte, though they were not specifically charged with it. Senior officers of the IDF, including Yisrael Galili and David Shaltiel, told the court that Lehi had hindered, rather than assisted the fight against the British and the Arabs. While the trial was in progress, some of the Lehi leadership founded a USSR-leaning political party called the Fighters' List with Yellin-Mor as its leader. The party took part in the elections in January 1949 with Yellin-Mor and Schmuelevitch heading the list. The trial verdict was handed down on 10 February, soon after the Fighters' List had won one seat with only 1.2% of the vote. Yellin-Mor was sentenced to 8 years and Schmuelevitch to 5 years imprisonment, but the court agreed to remit the sentences if the prisoners agreed to a list of conditions. The Provisional State Council then authorised their pardon. The party disbanded after several years and did not contest the 1951 elections. ^ a b c Laqueur, Walter (2003) . "Jabotinsky and Revisionism". A History of Zionism (Google Book Search) (3rd ed.). London: Tauris Parke Paperbacks. p. 377. ISBN 978-1-86064-932-5. OCLC 249640859. Retrieved 18 November 2008. ^ Joseph Heller 1995, p. 86. ^ Shapira, Anita (1999). Land and Power: The Zionist Resort to Force, 1881-1948. Stanford University Press. p. 347. ISBN 0804737762. ^ "ELIAHU AMIKAM Stern Gang Leader" (Free Preview; full article requires payment.). The Washington Post. 16 August 1995. pp. D5. Retrieved 18 November 2008. The [AMIKAM] Stern Gang – known in Hebrew as Lehi, an acronym for Israel Freedom Fighters – was the most militant of the pre-state underground groups. ^ Arie Perliger, William L. Eubank, Middle Eastern Terrorism, 2006 p.37: "Lehi viewed acts of terrorism as legitimate tools in the realization of the vision of the Jewish nation and a necessary condition for national liberation." ^ Leslie Stein, The Hope Fulfilled: The Rise of Modern Israel, Greenwood Publishing Group 2003 pp.237–238. ^ Ralph Bunche report on assassination of UN mediator Archived 7 May 2008 at the Wayback Machine 27 September 1948, "notorious terrorists long known as the Stern group"
^ a b Ami Pedahzur, Arie Perliger Jewish Terrorism in Israel, Columbia University Press, 2011 p.28. ^ a b "Awards for military service towards the establishment of the State of Israel". Israeli Ministry of Defense. Archived from the original on 17 April 2006. Retrieved 17 September 2018. The ribbon is awarded to: All those who were members of the LEHI underground for a term of six months or more, in the period dating from 1940 up until the establishment of the State of Israel ... Presentation of the ribbon began in 1980. ^ a b c Colin Shindler (1995). The Land beyond Promise: Israel, Likud and the Zionist dream. I.B. Tauris. p. 22. ISBN 978-1-86064-774-1. ^ Ben-Ami, Eliezer “Yehezkel”. "How was the Lehi symbol born?". Freedom Fighters of Israel Heritage Association (FFI-LEHI). ^ Calder Walton (2008). "British Intelligence and the Mandate of Palestine: Threats to British national security immediately after the Second World War". Intelligence and National Security. 23 (4): 435–462. doi:10.1080/02684520802293049. ^ a b Diamond, James S. (1990). "We Are Not One: A Post-Zionist Perspective". Tikkun. 5 (2): 107. ^ a b Hattis Rolef, Susan. "YELLIN-MOR (Friedman), NATHAN". Encyclopaedia Judaica. ^ Jabotinsky and the Revisionist Movement 1925-1948 Yaacov Shavit Routledge; 1 edition 1988) page 231 "Articles in contemporary Lehi publications talked about the Jewish nation as a heroic people, even a 'master race' (in contrast to the Arabs, who were considered a nation of slaves)"
^ Heller, 1995, p. 86. ^ a b c Nachman Ben-Yehuda (2012). Political Assassinations by Jews: A Rhetorical Device for Justice. SUNY Press. pp. 147–150, 185–188. ^ Heller, 1995, pp. 78–79. ^ Yaacov Eliav (1984). Wanted. Shengold Publishers. pp. 144–145. ^ Heller 1995, p. 91. ^ The Stern Gang: Ideology, Politics and Terror, 1940-1949 Joseph Heller page 114 "Above all, in the summer of 1943 Lehi had still not broken free from the doctrine of persecutor and enemy'. Even after the extent of the Holocaust was revealed, Lehi refused to depict Hitler rather than England as the main foe." ^ "הרוגי מלכות גליונית זכרון - התאחדות בולאי ישראל". ^ Andrew, Christopher (2009) The Defence of the Realm. The Authorized History of MI5. Allen Lane. ISBN 978-0-7139-9885-6. Page 922. Note 39. Pages 355-359. ^ Benny Morris (2003), The Birth of the Palestinian Refugee Problem Revisited, p. 239. ^ Benny Morris (2003), The Birth of the Palestinian Refugee Problem Revisited, p. 239. "the most important immediate effect of the atrocity and the media campaign that followed it was how one started to report the fear felt in Palestinian Arab towns and villages, and, later, the panicked fleeing from them." ^ UNSC "Archived copy". Archived from the original on 3 December 2013. Retrieved 30 November 2013. CS1 maint: Archived copy as title (link) resolution 57 (18 September 1948). 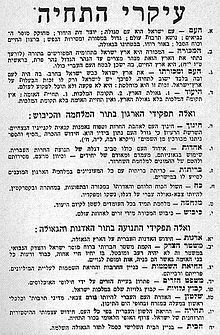 ^ "For the purposes of Regulation 8 of the Emergency Regulations — Prevention of Terrorism — 5748-1948, the Provisional Government has decided to declare that the group of people known as 'Freedom Fighters of Israel' and the members of the so-called 'Homeland Front' are terrorist organizations. By order of the provisional administration. Ze'ev Sharaf (Government Secretary)." ^ Baram, Daphna (10 September 2009). "Amos Keinan: Controversial Israeli journalist, writer and artist". The Independent. Retrieved 8 November 2009. ^ Segev, Tom; Arlen Neal Weinstein (1998). 1949: The First Israelis. Macmillan. pp. 230–231. ISBN 0-02-929180-1. ^ Melman, Yossi (13 August 2009). "Inside Intel / Time Bomb" – via Haaretz. (in Hebrew) Amichal Yevin, Ada (1986). In purple: the life of Yair-Abraham Stern. Tel Aviv: Hadar Publishing House. Munson, Henry (2005). "Religion and violence". Religion. 35 (4): 223–246. doi:10.1016/j.religion.2005.10.006. Perliger, Arie; Weinberg, Leonard (2003). "Jewish Self-Defence and Terrorist Groups Prior to the Establishment of the State of Israel: Roots and Traditions". Totalitarian Movements and Political Religions. 4 (3): 91–118. doi:10.1080/14690760412331326250. Ehud Sprinzak (1999). Brother against Brother. The Free Press. ISBN 0-684-85344-2. Wikimedia Commons has media related to Lehi (group).